St Lucia may not have coral reefs, but it does have perfectly clear emerald waters and brightly coloured tropical fish, perfect for snorkelling and other aquatic activities. All of St Lucia's beaches are public and travellers can pop onto any of the island's most famous stretches of sand. 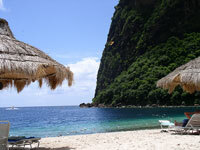 Some of St Lucia's best beaches include Anse Cochon or the solitary beaches on Anse Comerette. Anse Louvet is one of the best beaches for snorkelling, while the sheltered bay at Anse Chastanet is great for younger and more inexperienced swimmers.